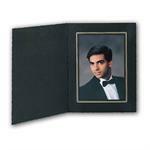 Personalize your Folders with Gold or Silver imprinting. Click on the Drop Down Menu Arrow to Choose the Number of Lines of Custom Imprinting. The Price Will Change Accordingly. Then Choose 1 or 2 Lines for Studio Imprint. Again the Price Will Change and Add it to the Other Lines. Then Fill Out the Imprint Sheet with The 1st and 2nd lines of Imprinting, if applicable, & Studio Logo Lines. Select the Location(s), Type Font, and Color and Your Finished.